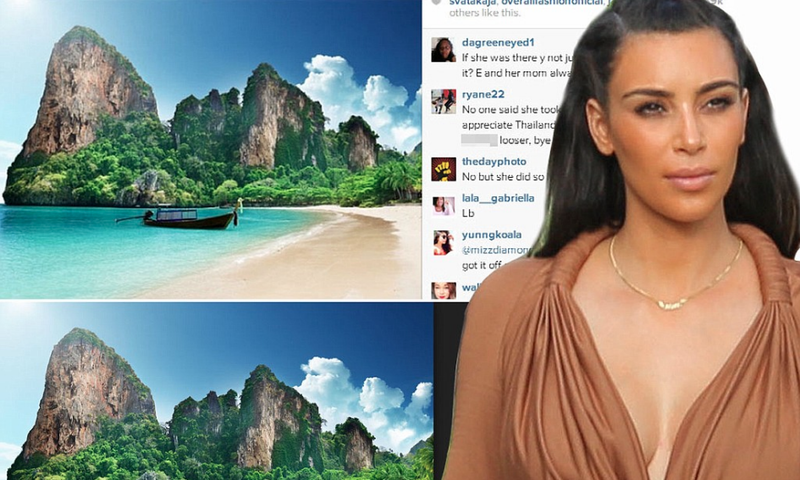 Kim Kardashian caught trying to pass off a Google images photo as her own vacation shot. Kim Kardashian has been blasted by her fans for taking a picture of a Thailand beach from Google images and passing it off as her own. The reality star recently returned to the States from her luxurious family holiday - and we were treated to a stream of selfies throughout the trip. But one picture wasn't all it seemed. The mum-of-one posted a picture of a sandy beach and clear blue waters, with a lone boat floating, and wrote: "Thank you for the beautiful memories Thailand." By then we were all so jealous we were almost numb to it. Her fans were quick to notice it was actually an image straight from Google, which can be found easily by typing in "Thailand beach". One wrote: "'Thailand beach' on Google," while another added: "This pic is off Google." And one fan added: "@kimkardashian so sad to think that you are suppose to be a reality star and can't even show us reality. @kimkardashian you are super fake." Maybe she just didn't have any photos she thought were nice enough to post?